Wilson’s 1965 collection Eagle and Earwig, originally published by John Baker in 1965, gets it’s first reissue in five decades by Eyewear Publishing. Now entitled Eagles and Earwigs, this hardcover edition has a new introduction by Wilson biographer Gary Lachman, annotations by Wilson’s bibliographer Colin Stanley and is 412 pages long. Like The Age of Defeat, also just reprinted, Eagles and Earwigs is rare in it’s original edition. Both titles show the development of Wilson’s new existentialist thought, with Eagles and Earwigs being particularly strong on what he dubbed ‘existential literary criticism’ a technique for not separating an artists’ personal attitudes from their work – the title comes from Aldous Huxley who gloried in the name of Earwig. The first essay in the book is a discussion of the modern (i.e. 1957) hero in literature and anticipates the central theme of The Age of Defeat, which was two years away. It’s all relevant to the twenty-first century. “It is my hope”, wrote Wilson exactiy sixty years ago, “that within the next two decades, the techniques of existential thinking will become a commonplace in England and America”. The opening words of Existential Criticism (the second essay here) were written a decade before the non-techniques of semiology and deconstruction began to influence the literary and philosophical departments of English and American universities, with postmodernism glibness becoming ubiquitous by the end of last century. Now commonplace and tedious, those reductionist techniques are a very tiresome cliche. Wilson’s ideas, however, remain powerfully relevant to twenty-first century individuals wishing to go beyond the acceptance of meaninglessness, a problem which is possibly more relevant now than in 1958. “Our modern culture has seen a gradual decline in the in the tacit sense of human purpose, fostered by materialist philosophies […] Consequently the notion of ‘prehension’ of the human effort to assimilate and overcome, has begun to disappear from out literature. The tacit sense of human purpose has been tacitly dropped”. Existential Criticism is a method to expose this unquestioned attitude rather than to wholeheartedly accept it whilst imagining that fine tuning linguistic ambiguities can free us from this ‘romantic defeatism’. The 1965 essay Phenomenology and Literature is short, but it is one of the best introductions to Wilson’s interest in Edmund Husserl. ”Phenomenology regards itself as the philosophical method” Wilson says, but we can forget just how important a method it is unless we practice it – “for ‘academic’ means nothing if not ‘limited’. We lose sight of the basic meaning of phenomenology if we forget that it is, at bottom, a mystical venture – the first mystical venture in human history to insist upon a strictly scientific method”. Imagining a scenario where Husserl meets William Blake, Wilson thinks they would have shared common ground. “For if the word ‘visionary’ means to penetrate through obscurities to the underlying truth, then all science and all literature are visionary in intention”. An essay on Nietzsche and Kierkegaard from 1964 finishes the first part (the book is divided into three sections: Literature and Philosophy, Individual Writers and The Writer and Society). The second section has essays on Powys and Hemingway, on Lindsay’s A Voyage to Arcturus, Madach’s Tragedy of Man and Mark Twain. There’s thoughts on the obscure L.H. Myers, The Shaw Problem and an amusing essay on Ayn Rand. Wilson receives a letter from Rand’s ‘organisation’ which reads: “Miss Rand would be very pleased to hear of your interest in her work – when and if you correct your offense against it in the same terms that the offense was committed: that is, publicly”. This section ends with ruminations on Henry Williamson, a contemporary of Myers, who wrote children’s favourite Tarka the Otter and whose reputation was tarnished due to his right wing politics (rather like Wyndham Lewis). The third section concludes the volume with rather more personal thoughts on publicity and writers (1959), particularly Wilson’s own brush with fame in 1956, and The Success Problem from the year after. “We are living, I think, in one of the most culturally treacherous ages that has ever beset Western civilzation”. In the final essay, Personal: Influences on my Writing (1958) Wilson states that he has nothing in common with the Angry Young Men “except my age”, preferring to align himself with “the tradition of an intellectual creation with it’s roots in analysis” which has the “eventual aim of […] a new form of self-consciousness”. Wilson would develop this through his new existentialist ‘foundation work’ in the next decade, and thereafter by analysing the darkest corners of human behaviour while all the time remaining an optimistic philosopher. Eagles and Earwigs can be purchased for £20 via Amazon. More information about Eyewear Publishing here. Wilson’s long out of print work on music, The Brandy of the Damned, has been reissued by Foruli Classics. “Dedicated to bringing the best music and popular culture books back into print.” I’m not sure if this is the shorter UK version or the expanded US version, but it incorporates some of the artwork from the UK version of the latter (confused?) which was published by Pan as Colin Wilson on Music. Phew! 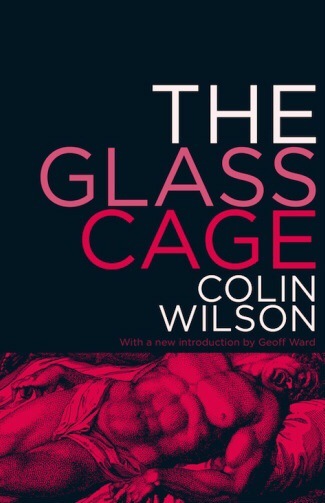 Meanwhile, Geoff Ward provides an introduction to a very welcome reissue of The Glass Cage. Published by Valancourt, it’s also available for Kindle.